Beloved is a ghost story. I'm sitting in a hospital room after about five hours of broken and fitful sleep (and only about five the night before), so it's just going to be a couple of quick updates today to our polls. First of all let's get started on our January poll. Best Speculative Fiction Author of Color. Most of our polls here at Writing About Writing are more diverse than almost any "best of" list I've ever seen, but because of the fucked up reality of whitewashed publishing they still tend towards white writers. So let's dedicate some special space to writers of color. Also, as the readers here at W.A.W. seem to be pretty particular to science fiction, fantasy, and other speculative fiction, so let's limit the potential nominations a LITTLE by focusing on those authors. 1- As always, I leave definitions up to your best judgement because I'd rather be inclusive. Let's use the Wikipedia definition of speculative fiction with those sub-genres, even though it casts its umbrella a bit wider than some people like. If you nominate authors who are whiter than Wonder Bread or a book that is clearly a western, I'll nix it, but I'm not going to get persnickety. If you think an author and their book fits, and they're not grotesquely inappropriate, I'll take it. 3- You may (and should) second as many nominations of others as you wish. No author will be going on to our poll that doesn't get at least one second, and it is not unheard of for a poll to have SO many nominations that I only take the results with two or more "seconds." 4- Please put your nominations here. I will take books nominated as comments to this post on other social media; however, they may not get the seconds you need because no one will see them. 5- Your nominations should be based on the author's whole career in speculative fiction. 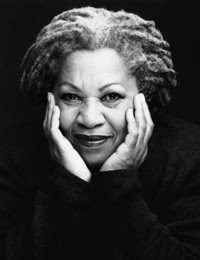 If, like in the case of Toni Morrison above, your nomination is based on a single book, make sure it's a really good one. Secondly, we are having a strange tie on our current poll from December for best Y.A. author, so I'm going to run that for at least another day. Please go and vote (whether you're voting for the first time, or you've waited longer than a week and the system will let you vote again). Help be kingmaker! Malinda Lo and Junot Diaz, with, as ever, apologies to so many others (curse your despotism, Brecheen!). Mary Anne Mohanraj. And Auros says Steven Barnes is good but I haven't actually read any of his stuff. Seconding Octavia Butler and Saladin Ahmed! Gloria Naylor and Isabel Allende. Salman Rushdie - "Haroun and the Sea of Stories"